Yoga is becoming increasingly popular, and for good reasons. It combines exercise with mindfulness so that you can reap the numerous rewards of both. Yoga can be as challenging or as gentle as you need it to be, which makes it accessible to anyone. If you’re wondering if you should join a yoga class, consider just some of the amazing benefits you can expect from your yoga practice. Within the first class, you will notice the difference. As you warm up gently, then deepen your poses, you’ll be surprised how much more your body is capable of at the end compared to the beginning of the class. Yoga gives you a positive, healthy way to deal with stress by moderating the body’s exaggerated reaction to stressful situations and reducing inflammation. People who practice yoga regularly enjoy improved overall well-being and decreased anxiety. Yoga is not just exercise; it is meditation in motion. The movement makes it easier to focus on your breath and on your body, leaving behind everything else that was on your mind before you walked into the studio. You will find that after your class you feel more peaceful and you have a different perspective on whatever was bothering you earlier. Yoga encourages you to look inward, accept what is without judgement and not compare yourself to others. During the class, your teacher will remind you consistently to listen to your body, disregard what everyone else around you is doing and choose the option that is right for you at this moment. This approach to movement has been found to promote body awareness and improve body satisfaction. Inadequate sleep affects a large percentage of Australians. People are having a hard time falling asleep, they wake up frequently or get up in the morning unrefreshed. Yoga provides an effective solution to our sleep problems without negative side effects. Over 55 per cent of people practising yoga report improved sleep. Back discomfort or pain is very common in our sedentary lifestyle. Research has found that yoga is a good alternative to physical therapy in easing back pain and, again, it comes without the side effect that we get from medication. Only 20 minutes of yoga will boost your memory, strengthen your focus and improve your ability to take in new information. Imagine how much more you can learn and create if you make yoga part of your daily or weekly routine! Ready to experience all these wonderful benefits for yourself? 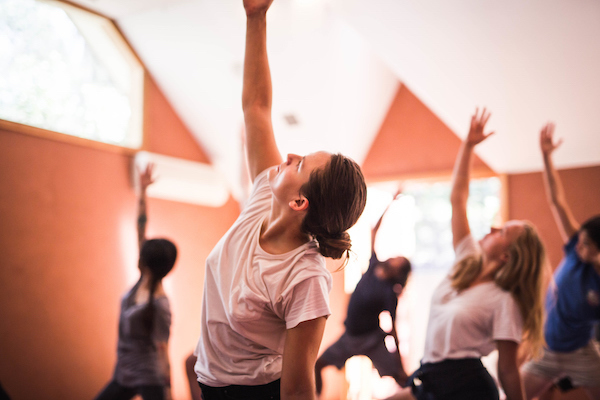 We offer three different classes at our serene studio in the Blue Mountains. Choose your class here.